It is NOT your replacement for Facebook! Perhaps not coincidentally, the day following those invitations being sent, I received - at two personal email addresses - a plea from a Brother Mason in Canada claiming to have been in London where he was mugged. The email, somewhat predictably, asked for cash. However, as this Brother was seriously ill at the time and such travel would have been completely impossible for him, I knew the message to be a scam. Further, the email was nearly identical to one that another Mason had ostensibly sent this past summer, again claiming to be in London and needing cash. Needless to say, it was false also. What has happened - in both cases - is that a Mason's email address book had been stolen. Is it possible that the Canadian Mason signed into the facelodge.com website where his address book was electronically purloined? Perhaps. Be forewarned that if you do receive an email from someone you know claiming to be in London (or anywhere unexpected) and needing you to send cash, it is a scam! If the situation were as it's presented in the email, why didn't your friend just phone you and talk to you personally? Don't fall for these scams, Brethren! Shortly after noting our concerns on another website, we received the following e-mail which makes this appear EVEN MORE of a scam. The notes I've added in red explain why! Really? They have a database which can check someone's membership in every Grand Lodge in the world to ensure that the only people they allow in are "regular Freemasons"? And by which Grand Lodge's standards? ANYONE even vaguely familiar with Masonic recognition understands that not all Grand Lodges recognize all others. Further, why is this requirement imposed in the first place? They are not a tyled lodge.... The person/persons behind this endeavor seems to want to continue the obfuscation. 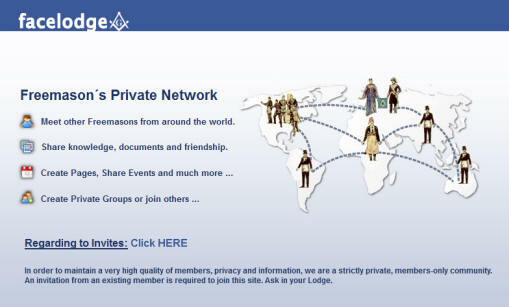 You have been invited by facelodge to join Facelodge a private and by invitation only Masonic Network. The following invitation code is valid just for this email address, you may use this email address during your create account process. You are being invited to join Facelodge since you claim on your website not have been invited. Yes, I did "claim" I hadn't been invited - but that was only a small part of my concerns and I noted that I personally would never join an online site of this type without knowing who was behind it. And as commented above, the ownership of the site is hidden and the 'look and feel' of Facebook appears to have been misappropriated. This 'personalized form' e-mail completely ignores all of these concerns! Feel free to create your account, and invite other Br.·. of your Grand Lodge if you are pleased. Facelodge is not a Scam as you claim. Enter and see that for yourselves. "Come into my parlor..." said the spider to the fly. If the site is NOT a scam, why hide who the individuals are behind it? As one who is extremely active online, I'd advise any Mason to use caution before becoming involved. Just 'trying it out' could result in a virus being placed on your computer, personal records being stolen, and more. Their invitation still seems awfully like a scam. When someone is doing something right, they don't have any problems answering questions or explaining themselves, even if they've been 'off base' in their actions. Particularly when bogus pseudo-Masons, however, try to do things, they invariably become angry and defensive if they're questioned. What's more, they try to mislead through the use of 'tricks' which they think will not be noticed. Sadly, they're often correct in their assumptions and get away with a lot of things that - upon examination - no regular Mason would want to become involved with. Such is the case with the person behind the Facelodge.com scam, it would seem. When a question was asked on the Grand Lodge of Massachusetts discussion forum about this, I replied expressing my opinion. Immediately thereafter, an unidentified person signed up to defend the site. Curiously, he claimed to be from "Washington, Washington". Make sense to you? No, not to anyone living in the US either. You can read the full exchange here. On another Masonic forum, you can find a similar discussion. Read carefully and you'll note a couple of references to "Ed". That's me, folks. The phoniness of the site's claim to 'regularity' had been challenged and was, of course, met with predictable antagonism. Had this been the work of a regular/recognized Mason, one would have expected to receive a full and frank explanation of what it was all about. There was/is no need to hide and to not disclose the parties behind the endeavor - unless, of course, it's not totally legitimate! Thus we'll reiterate: this is NOT going to be what you think it is - and don't blame us if you wind up getting your address book or other personal information stolen as a result of your involvement. Got more to add? Drop us a note (instructions are below: follow them, please) and we'll be happy to add your experiences here. Oh, and in this case, please do identify yourself and your lodge (with location) so we can confirm you're not just the same non-English speaking person trying to continue the scam! And, perhaps coincidentally but likely not, a number of non-published internet email addresses we established for 'throw-away' purposes have experienced a HUGE influx of junk mail, much of it from similar sources. For want of a better explanation, we trace it all to facelodge.com. Thanks, fools! Created 6 August 2011 - but they were gone soon afterwards, another scheme to trap the unwary unmasked!